Now finally – the story from Marianne Efinger continues – and this time I have a lot of patterns. In the past three weeks it was pretty hectic for me – I had a lot of work in the laboratory and even a lot more work in the vineyard. I would have not really managed to publish the patterns so early if I wouldn’t had help from my friend Nina. 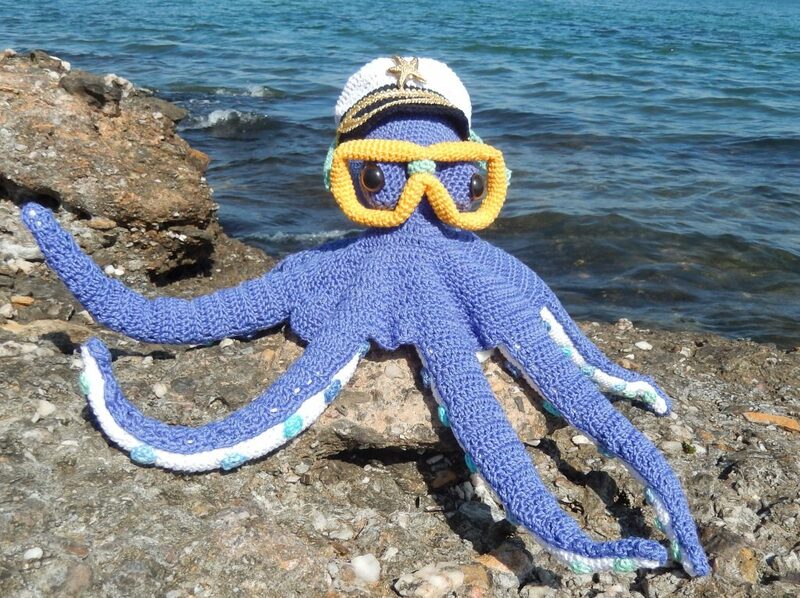 She helped me with crocheting the legs for the octopus and she criticized and supported me with the captain’s hat. Thank you, dear Nina, you are a treasure! But now I wish you a lot of fun with Caroline and Paul, and at the end of the story you will find all the instructions as PDF download. Paul had eight strong arms equipped with suckers that could do the job with no problem. So he held Karoline tight, gripping her shell as Karoline laboriously squeezed herself out. With one final push she was free of the dreadful thing. At first, Karoline was thrilled. She felt as free as a sea horse and decided to gallop off with the waves. Crunch! Before she knew what was happening she’d landed on her nose. Without her shell her legs had no support, they were as soft as butter and she found herself crumpling up. She couldn’t even walk straight; all she could do was hobble. And to cap it all she couldn’t dance in the water like Paul because she was too clumsy. But that wasn’t the worst of it. Now she had no shell she was hunted by the fish and seabirds who thought that a little crab was a welcome addition to their menu. 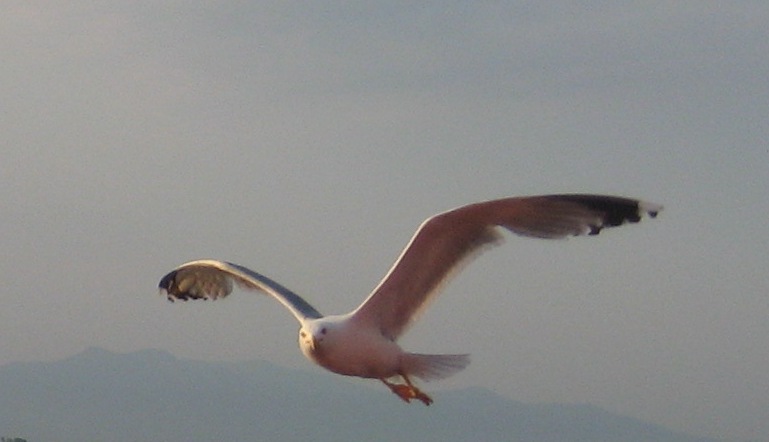 Karoline began to realize that her wish might not have been such a wise idea after all. But she’d made the mistake and now it couldn’t be undone. Paul was feeling guilty as he wasn’t entirely innocent of Karoline’s misfortune having egged her on too. So he took it upon himself to protect her and to help her find hiding places amongst the rocks where the fishes and seabirds couldn’t find her. A couple of days later Paul was near the white sand beach with the palm trees that Karoline had used to love walking along. It was stormy and the wind whipped the palm trees mercilessly. Suddenly a coconut fell from one of the palms and hit a sharp stone, splitting it neatly into two. As the next wave crashed up the beach it washed the coconut dishes into the sea. Paul quickly swam over to the coconut and grabbed both pieces. First he treated himself to a bit of the delicious white coconut meat. Then he swam with the coconut dishes to a blob fish who used its gummy spit to glue the two halves together, like a hinge, so they could open and close. When the blob fish had finished the job to his satisfaction, Paul flitted away with the coconut straight to Karoline and handed it over as a gift. The little crab jumped happily into her new armored home. “So now you are the crab coconut,” said Paul happily. And from then on Karoline and Paul were best friends. And now Karoline and Paul are world famous because someone heard their story and told it to you. 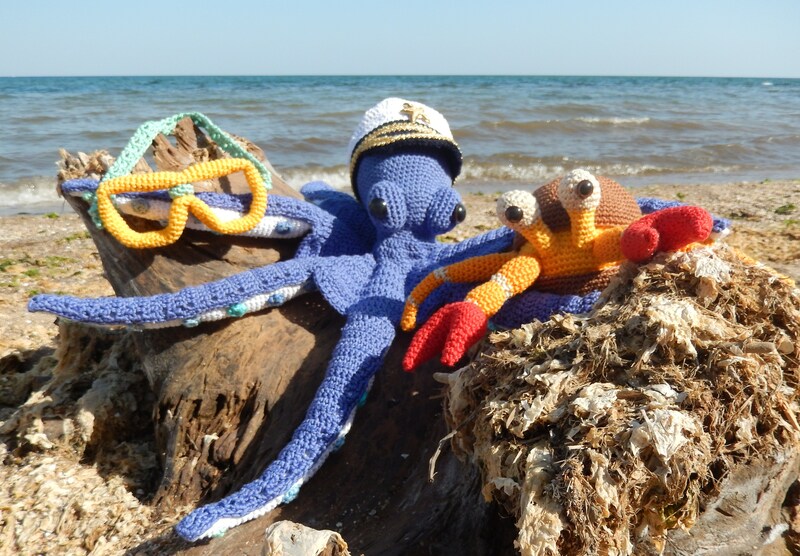 And then other people who heard the story took colored yarn and a crochet hook and turned them into Amigurumi. And even now all children love them so much that it is all they want for their birthdays. I just finished Karoline for my daughter’s birthday. Since she is a Cancer it is perfect! The directions were great – love that the stitch count was shown at each row to keep me on track. Easy to follow, clever (loved the pipe cleaners) and the color photos were a big help. The colors chosen for both Karoline and Paul are beautiful and the photography so cute! Since I am also a storyteller, I can’t wait to give it to my daughter and tell the story. And now there is Paul! Can’t wait to make him too! Thank you so very much! Thanks Vanja, I’m always happy to hear from you! 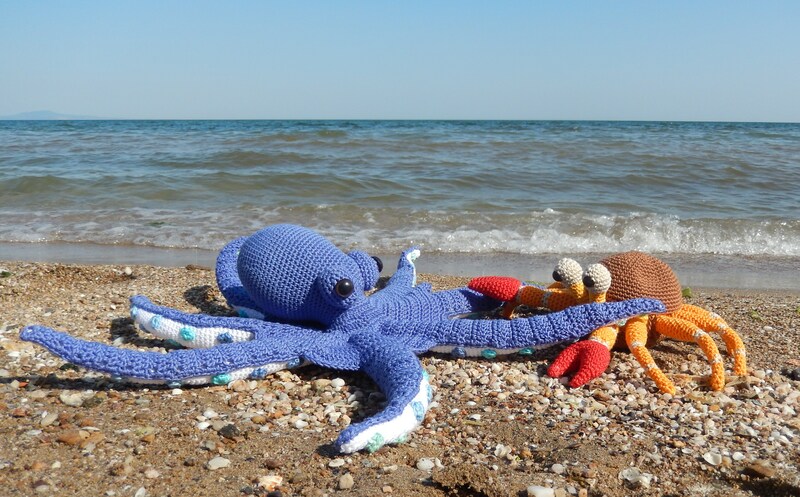 Since you also make great Amigurumi, it means a lot to me, when you love my pattern. Love your story and can’t wait to make the items and characters. I will use them to entertain my grandaughter. She loves stuffed animals so much and treats them like real live animals. Thank you so much for the patterns and the story! Dear Pamela, thank you for taking time and leaving this nice note. I’m sure your granddaugther will love Paul and Karoline. I wish you a lot of fun making them! 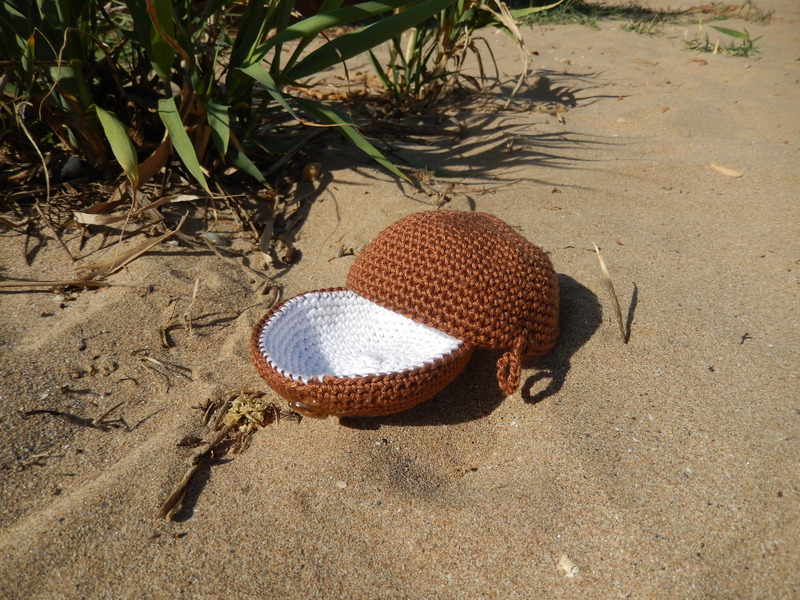 When I wrote the story of little crab coconut I never thought of such a beautiful result. To see Paul and Karoline now really existing makes me so happy. This was the first time for me to learn about amigurumi, before I did not know anything about. But it’s so great ! Thank you, Karin for that delightful cooperation. 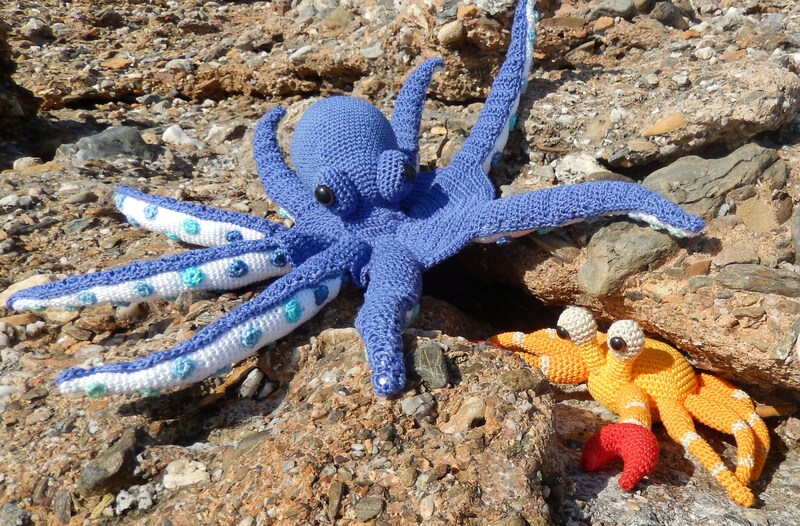 Hello Marianne, I had a lot of fun designing the crab and octopus for your wonderful story! It was a pleasure to work with you and it made me so happy. 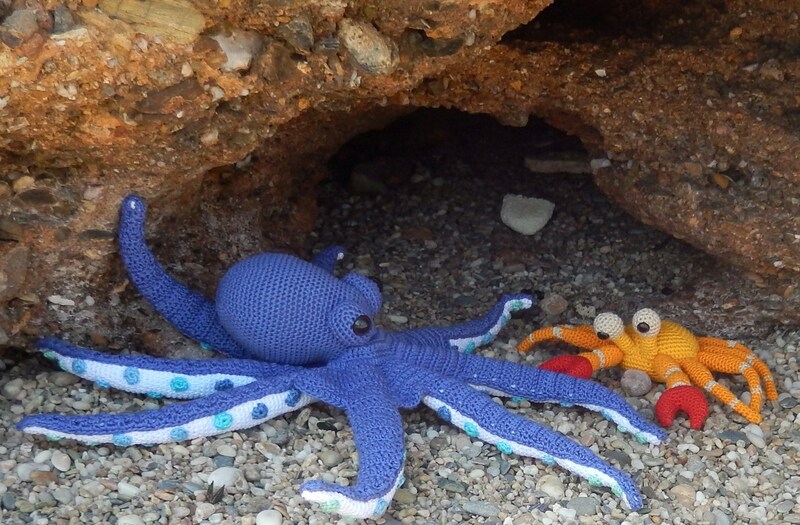 But above all, it was such a great project for the children, who can play now with the octopus and the crab. They can listen to your story and together with their parents they can also find their own stories with Paul and Caroline. Thanks for the compliment. I am especially pleased that it comes from a blogger who leads an equally creative blog! I feel so happy to have met you. Can’t wait to see what you do next! I’m making Paul and absolutely love him so far, but can’t figure out how to start the ‘suckers’. Do I start with a magic ring or chain? I can’t just make 5 single crochets without a chain to stitch them in? Or is it just one row, a magic ring with the amount of stitches mentioned and then finished off? Think I’ll try that later today. Thanks for the pattern and your answer. Bye! make a knot at the back, so you don’t have to sew the threads. Have fun with Paul and thank you for the hint! Hi I would love the pattern for the octopus for my twin daughters but can’t seem to figure out how to download it ? 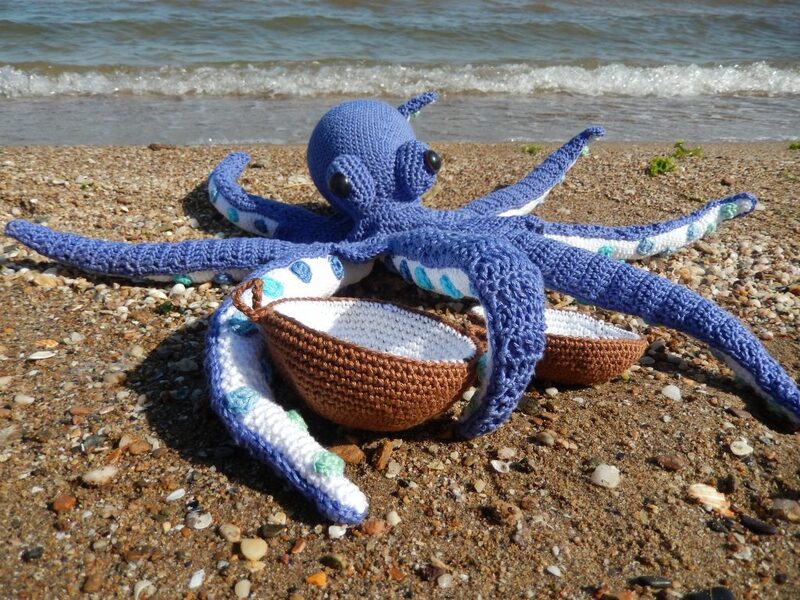 Please can you tell me how to download the pattern for octopus Paul I would love to make him for my twin daughters for Christmas ?